That picture represents a terrible, terrible idea. Bad. Awful. Nasty. But one that is oh, so tempting. After the Visual 6502 Web site posted the control logic for the 1802, there has been a certain amount of wishful sort of thinking going around on the COSMAC ELF mailing list – along the lines of “I wonder how hard it would be to build an 1802 out of discrete transistors.” I’ll admit it. It crossed my mind. I’ve been working on building the 1802 control logic in Logic Circuit (see my last post) but I started wondering what it would take to build the logic gates that I’m simulating out of transistors. 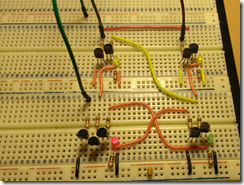 So I did a little searching on the Web to find out how to build a 2-input NAND gate out of transistors. Turns out that it’s incredibly easy to find that information. 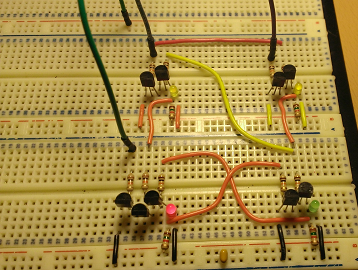 And once you’ve found it, it’s pretty darn easy to build one on a breadboard. Or four, ‘cause that’s what you need to build a D-type transparent latch. That’s what you see there on the breadboard. Each of the little groups is a NAND gate, three 2-input NANDs and one 3-input NAND. In the section of the control logic that I’ve modeled there are 10 transparent latches of various orientations. The number of transistors goes up pretty darn fast in this thing. Content copyright © 2007-2010 Chuck Bigham.